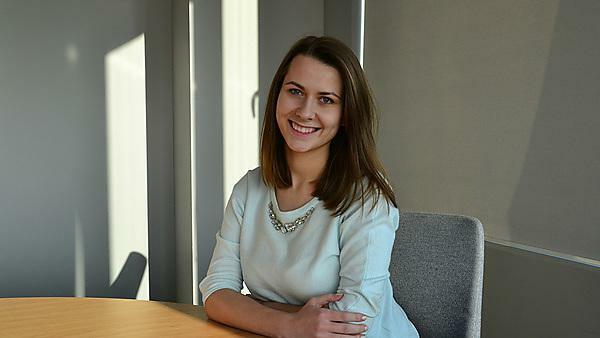 Marija Potapova now works as a resource planning specialist for Transcom Worldwide in Vilnius, Lithuania. After I received my exam results I went back to Lithuania and immediately started to look for a job in the capital. I aimed for a job related to my degree, and preferably in English. I heard from a lot of people that it was going to be really difficult, if not impossible, to get a job, but I actually had one after the second job interview. I started with one small project, and now I have five under my management: working with countries like Sweden, Norway and the Netherlands. And there are more to come. Probably to earn the trust of my colleagues who are located in other countries. All our communication is via phone and email. They have their way of working and I have my way, and sharing these experiences without seeing your colleague's face and gestures can be challenging sometimes. I have received some very useful practical knowledge during lectures and tutorials, which I use now almost every day at work. My experience as a volunteer and participation in different projects has also really helped me during my job interviews, and I believe that this has made my job application also quite successful. I have a lot of sweet memories from my time at university. It might sound funny, but probably one of the best memories is studying at the library with my course mates for the dissertation. All the different subjects, all the different experiences, and just all the people from the course in one place, listening to each other, helping each other and learning from each other; and then printing your work together and all the photos of us with our coursework. That was really amazing learning experience. Yes, I made some friends for life at university. It’s quite funny because when I saw a big poster during welcome week which said that I would make lifelong friends, that actually came true - even though I didn't think I would at that time. Yes, most definitely. Plymouth University delivers many different courses, has amazing lecturers with real life experience, and gives you all the best opportunities to learn and study. You just have to see and use them. For more information about studying financial economics, please visit our BSc (Hons) Financial Economics. Interested in a career in business? Take a look at the Plymouth Business School for more information.